In fact owners Thomas and Ellen Mears are still grinning about the visit of Steven Ray Tickle of moonshining fame.Tickle's visit brought at least 400 customers to Bootleggers who were ready to shake the hand of the famous 'shiner. Tickle's visit brought at least 400 customers to Bootleggers who were ready to shake the hand of the famous 'shiner. "Tickle was down to earth and friendly to everyone, especially the ladies," laughed Thomas. "We hope everyone had a good time." "Tickle was down to earth and friendly to everyone, especially the ladies," laughed Thomas. "We hope everyone had a good time." In case you are unfamiliar with Tickle, he's the lovable and unflappable star of the Discovery Channel's reality TV show named "Moonshiners." In 2013 a new show named "Tickle" was spun off. Fans of both shows remember when Tickle filled the water tanks of his motor home with moonshine instead of water and sold the 'shine that way. Tickle is a master of many things including carpentry, mechanics and moonshining. From an early age in Danville, Virginia, Tickle gained a wealth of old-time distilling knowledge from older relatives. He experimented with recipes on his own ten-gallon still using a turkey fryer, jelly jars for double-thump kegs, and a shotgun condenser. Addicted to perfecting his craft, Tickle often states, "It gets in your blood. I'll moonshine 'til the day I die." Working with the Sugarland's Distilling Co. in Gatlinburg, Tickle's Dynamite Cinnamon Moonshine is the end product. 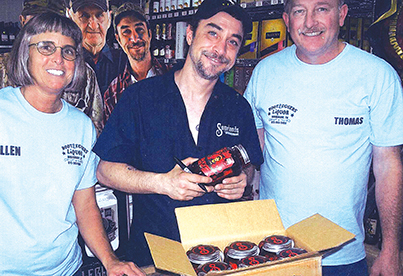 "I'm really liking working with the people here at Sugarlands Distilling Company," said Tickle. "When I first started talking to them, they said we are a family here and if you don't feel like you belong in this family, we aren't the right people. Great way to look at this because I do feel like these folks are just as much my family as my real family."